Lately I’ve been feeling very sad about the world. There have been some moments of joy, such as this week’s Carbon Tax success in the House of Reps. Australia is taking action against climate change. Despite the millions of dollars spent by those with a vested interest in dirty pollution, we’ve got a progressive policy through our parliament. Hooray! I’ve also been watching the Occupy Wall Street movement with interest. When you’ve got a situation where 1% of American society owns over 40% of the wealth, it’s not hard to see that this is going to cause mass discontent. 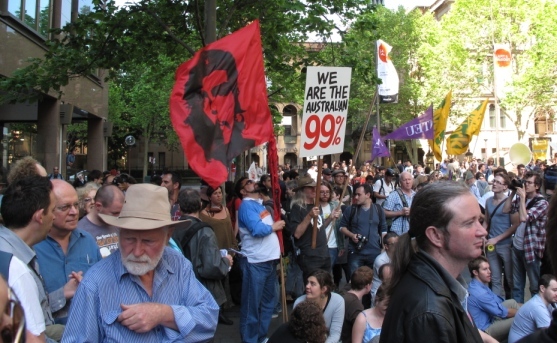 I visited the Occupy Sydney rally yesterday, mostly as an interested observer and a little bit as a sympathiser with those protesting against corporate greed. Back to why I’ve been feeling sad: it might be hard to make out this photo because it’s drenched in shadow. Let me describe it for you. It’s a collection of pokie machines on a balcony. 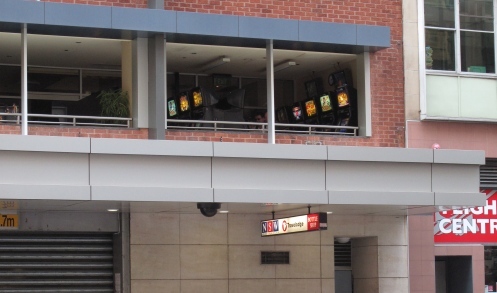 Why would someone put pokie machines on a balcony? Because it allows pokie addicts to smoke while they gamble, that’s why. No need to take a break from tipping your monthly salary into the rich club owner’s pocket to have a cigarette! Isn’t that nice of the club owners, to cater to their clientele’s needs? If capitalism is what is driving Australian pubs and clubs to take advantage of those in society who can’t control their addiction to pokie machines, I want no part of such capitalism. I’m starting to sense that the Occupy Wall Street movement, which is spreading all over the world, is not going away quickly. No doubt I’m obsessed with my book, Conspire, but again I’m seeing a coincidental correlation between my plot and the Occupy Wall Street movement. One of the chapters in my book starts with this sentence: ‘Gerome marvelled at the American passion for protest.’ At the core of Conspire is the idea that it’s very dangerous to centralise power into the hands of a few rich people. Going back to the Carbon Tax reform, a lot of the anti-Carbon Tax activity, whether it be mainstream press articles, social media ‘astro turfing’ or blatant mass media campaigns, was paid for by a handful of mining billionaires. Again, if capitalism allows the richest in society to control the policies of a government, that society is broken. I’m looking at you Gina Rinehart. Sucked in – you’ve lost this fight. I hope the millions you spent fighting against action on climate change didn’t all go directly into Rupert Murdoch’s pocket as if it did, most of that money will be trickling into lawyer’s pockets right now. What a waste!